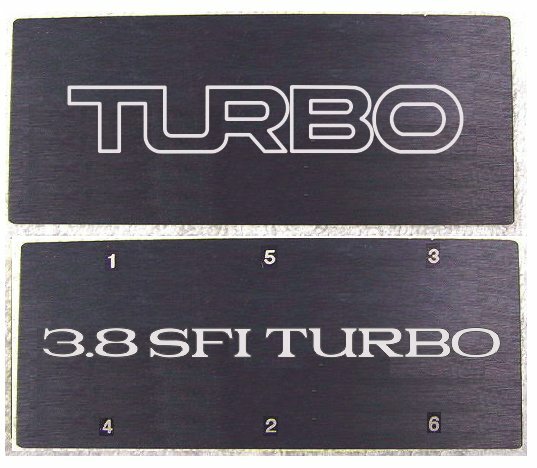 These simply affix to the top of your coil plate with supplied thin high strength double tape. We highly recommend getting your spark plug numbers engraved on these as it comes in real handy at spark plug changing time! These are all now being laser engraved with the exception of the color 6 logo full color option which is available with the Buick Motorsports or GN plates. We didn't forget the 84-5 Hot Air cars. We also make coil plates to fit those as well. Below is a pic of the CCCI hot air coil plate. To assure you receive the proper products, PLEASE check the appropriate boxes below.